If you need to take card payments in today’s dynamic and fast moving world there are many options available from a wide range of providers. Richard Bradley, Independent Payment Expert, explains. Visa and MasterCard manage the majority of the credit and debit card network and your relationship with them will be via a card processor. All the main UK banks have either their own card processing business or a relationship with a third party processor. With a significant amount of income to be made in processing card payments it’s not surprising that when you open a business bank account, or request details on setting up a card payment facility, your bank will recommend their own service. The key here is that you are free to use any processor, no matter where you bank. There are also dozens of sales companies that trade under a variety of card payment names and sell under licence from the card processors, with most employing commission-only sales staff. If you’re in a High Street location, you’re likely to have had a number of them call in already! To prepare for this complex marketplace, here are five questions to ask to make sure you’re getting the best deal for your business. What fees will I be charged aside from the cost of each transaction? Other than the percentage fee for processing the card payment, look out for any ‘hidden’ fees. These include authorisation fees per transaction, annual/monthly account fees and additional fees for telephone payments. If you’re not expecting to process many transactions at first, high minimum monthly processing fees may catch you out and can sometimes be as high as £25 per month. Many businesses are also being charged high monthly fees for Payment Card Industry (PCI) Non-Compliance. 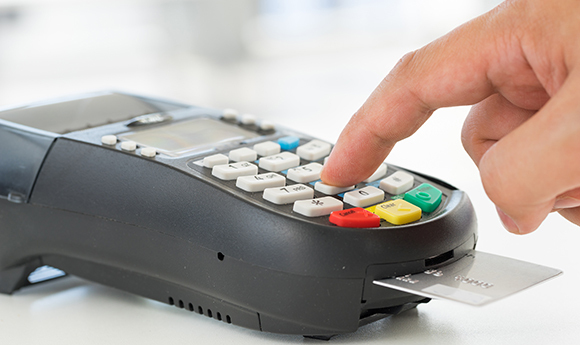 If you are a merchant of any size accepting card payments, you must comply with the PCI Data Security Standards, which help businesses process card payments securely and reduce card fraud. Your card processor should provide guidance and refer you to their preferred partner to arrange a certificate, avoiding non-compliance fees which can be as high as £50 per month. As a result, choosing a supplier who’ll provide help and support in becoming compliant could save you a lot of money. Ideally, you want a processor that won’t charge for this. Some processors offer a 30-day notice facility, but if you must pay a fee for leaving early it shouldn’t be any higher than £200. The main question to ask here is around the length of the card terminal contract you will be signing, which can be for up to five years, and effectively tie you in for that period. The best advice here is to use a company who works with multiple processors with the benefit of being able to switch if required, using the same card machine which can re-configured for a small fee of up to £30. Blended or Interchange-Plus pricing? Are they both available and which is best? Your card processing costs will be priced on a few levels (consumer debit cards, consumer credit cards, commercial/business cards) and this is where the term blended pricing comes from. The processor is effectively charging you one rate for a variety of card types on each level, with additional fees added for transactions classed as non-qualified/secure or cards that have been issued outside the European Economic Area. The benefit of blended pricing is that it’s straight forward. Interchange is the fee paid by the processor to Visa/MasterCard which in turn goes to the issuer of the card being used by your customer. This is a significant cost to the processor and as a result the profit margins available to them can vary substantially depending at what blended pricing level they place each card type in. The benefit of Interchange Plus pricing is that you can clearly see the margin/profit element being taken by the processor and remove virtually all non-qualified fees which can be as high as 0.5% on top of the transaction charge. You are going to need help when, for example, your terminal malfunctions. Look for a processor that offers support 24 hours a day, 7 days a week. Most processors offer on-line reporting, which can be a valuable management tool with the additional information it provides and will also avoid a monthly paper statement fee. Where can I get independent advice to ensure I get the best deal for my business? There are established and independent companies that can provide a range of advice that will be specific to your business, card volumes expected and how you’re likely to accept card payments. Your local TaxAssist Accountant is a very good place to start as they’re likely to have a relationship with a company they can recommend, or if you’re a member of a trade association they will often provide advice through their member services. Also try an internet search on sites such as Money Saving Expert for feedback on the processor and/or third party you’re about to sign up with.